Security ratings are only as good as the data and attribution that backs them. The ThreatMarket™ data engine leverages sophisticated reconnaissance capabilities to build the industry's most comprehensive and relevant security intelligence database. ThreatMarket uses advanced machine learning algorithms to reliably predict risk, precisely attribute findings, and accurately calculate a security score. 80% of the data used to compute SecurityScorecard ratings is collected by ThreatMarket, our proprietary search engine. ThreatMarket non-intrusively scans the Internet to identify vulnerabilities, leverages a battery of honeypots & sinkholes, and utilizes data from commercial and open source threat feeds. In addition, ThreatMarket collects millions of data points and analyzes them across more than 75 cybersecurity factors. Our security research team continuously develops new and innovative collection methods and techniques to reveal vulnerabilities and active exploits across the web. We use machine learning algorithms to quantify and rank the factors that are most likely to predict a cyber breach. Download this 40-page eBook and learn what it takes to build a world-class vendor risk management program for your business. ThreatMarket is an internal big data platform that normalizes the data, removes noise from signals, and organizes it into relevant silos. The system also provides global IP Attribution, which allows the platform to calculate which internet-facing IP addresses belong to which companies. The platform then connects users across the organization, including security analysts, risk management professionals, executives, and engineers, with ThreatMarket’s deep security intelligence and analytics capabilities through the user-friendly SecurityScorecard interface. ThreatMarket is the engine that drives Insights, our intuitive user interface. Insights connects users across the organization, including security analysts, risk management professionals, executives, and engineers, with ThreatMarket’s deep security intelligence and analytics capabilities. 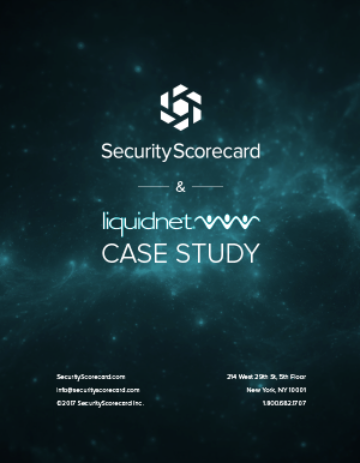 SecurityScorecard is changing the way enterprises and vendors communicate about cybersecurity and risk. We enable you to easily provision vendors and business partners with free, unlimited access to their scorecard. This allows you to proactively collaborate to resolve security issues and build a more secure ecosystem. SecurityScorecard is a force multiplier for my team, allowing us to do things we could not do before. It’s like having another dedicated vendor management team member.